Hooray for the Hawthorne Valley Farm Store in Ghent (Columbia County, NY) which had organic strawberries from Thompson-Finch Farm and Blue Star Farm’s CNG strawberries available. 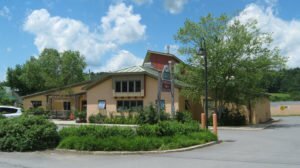 The Hawthorne Valley Farm Store is a welcoming place with a well chosen variety of organic and local foods, many grown and produced on this Hudson Valley biodynamic farm. 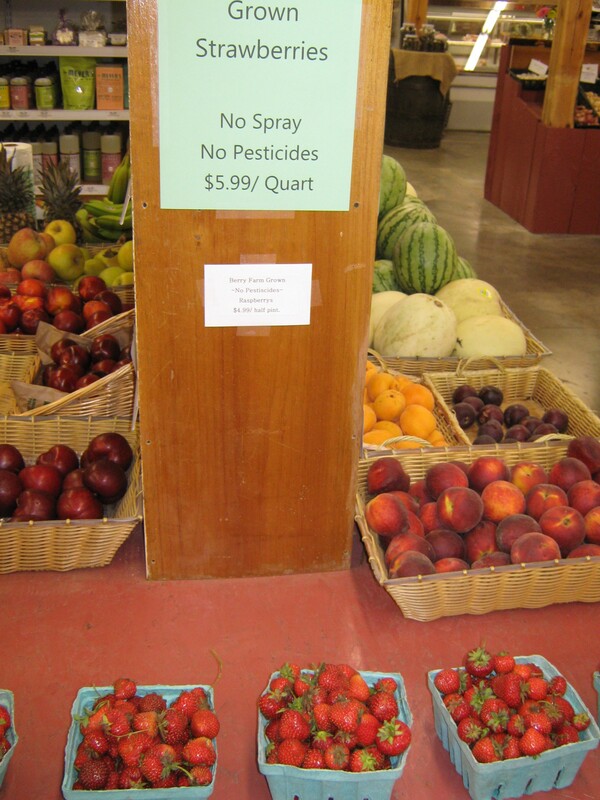 The Chatham Berry Farm’s no spray, no pesticides strawberries are an excellent value at $5.99 per quart. 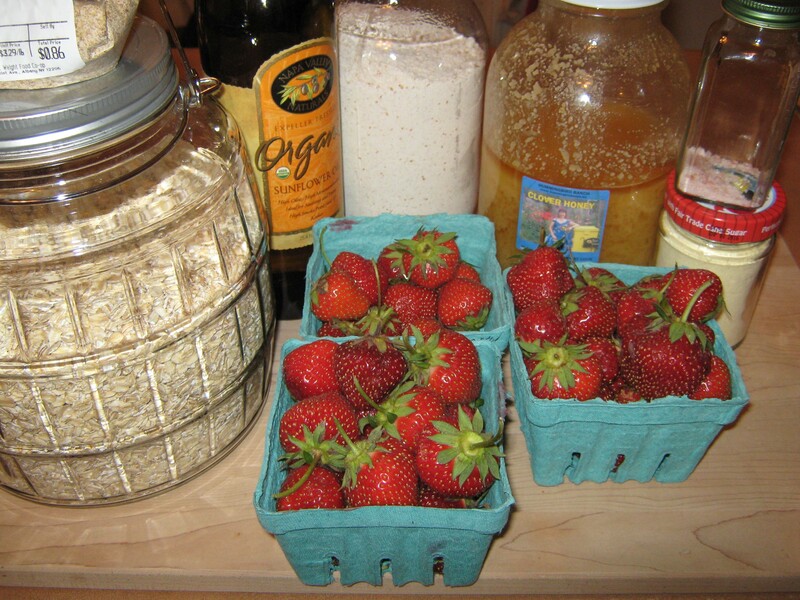 Gathering the organic and local ingredients for the oatmeal strawberry squares. 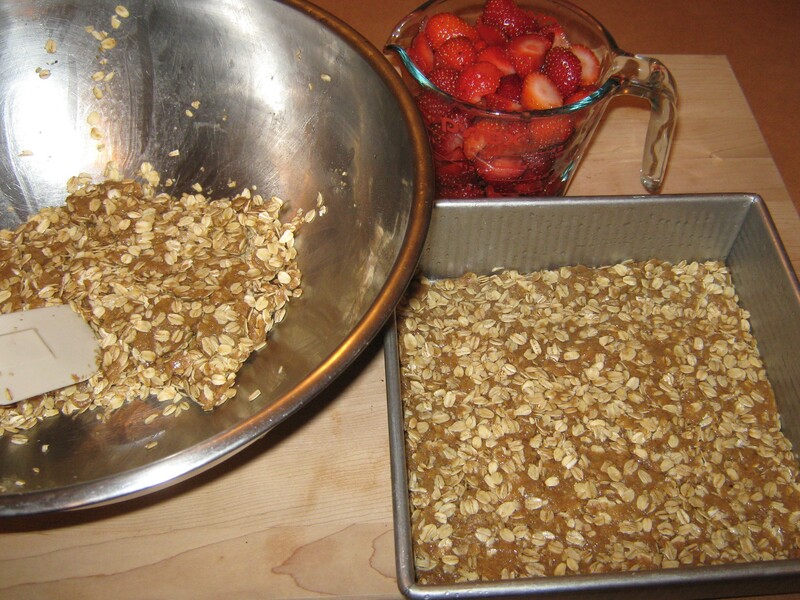 Half of the mixture pressed flat into pan to be topped by cut-up organic strawberries. 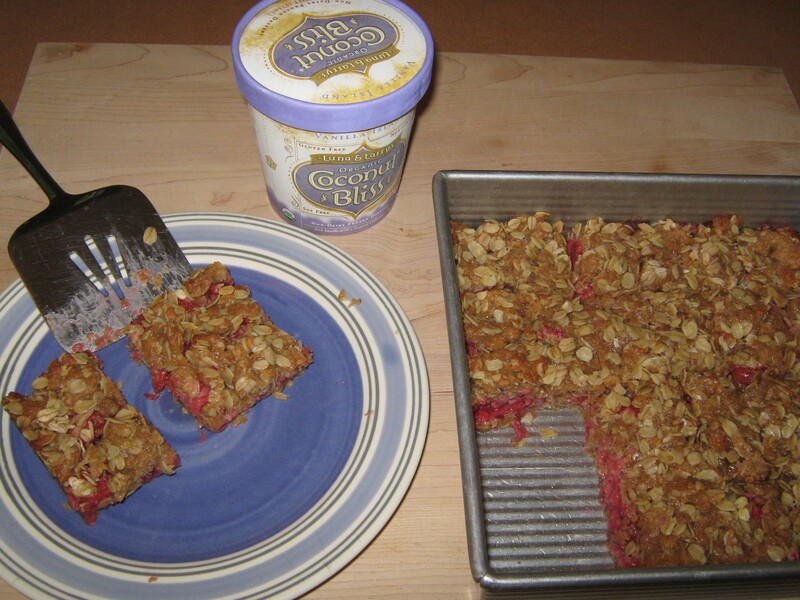 Oatmeal strawberry squares plus a scoop of organic Coconut Bliss makes for a delicious and wholesome dessert. Reporter Sam Roberts’ story in the New York Times last month on the death at 98 of Beatrice Trum Hunter, who was the author of The Natural Food Cookbook (first published in 1961 and the first of her 38 books), caught this home cook’s eye by including three appealing recipes as a sampling of her cookbook recipes. Decades before organic, raw and natural became watchwords for the most desirable of foods, Roberts notes that Hunter had become an apostle of whole grains, honey and vegetable oils as substitutes for refined flours, sugars and animal fats. The recipe for German Apple Cake included in Roberts’ story looks irresistible, but the local apple harvest near my Albany home in upstate New York is still a couple months away. And the easy to make recipe for oatmeal fruit squares in the 1961 cookbook (which I recently obtained in a paperback version from a used books seller) seemed a simple way to enjoy a delicious and wholesome dessert using late spring/early summer seasonal strawberries. Not so simple was finding local and organic strawberries, which I felt had to be used on the occasion of remembering Beatrice Trum Hunter, who was ahead of her times by warning against the artificial additives, processed foods and preservatives that were proliferating in the American diet. Roberts references Hunter’s blunt words: Food treated in this manner may appear brighter and last longer, but the people who eat them don’t. 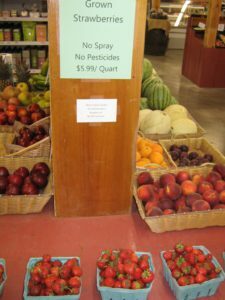 Moreover, conventional strawberries top the Environmental Working Group’s 2017 Dirty Dozen list of fruits and vegetables with “high pesticide loads” that should be avoided “if at all possible” as we reported this past April. I had no luck finding local and organic strawberries at the Troy Farmers Market across the river from my home in Albany or at my local food co-op, the Honest Weight. 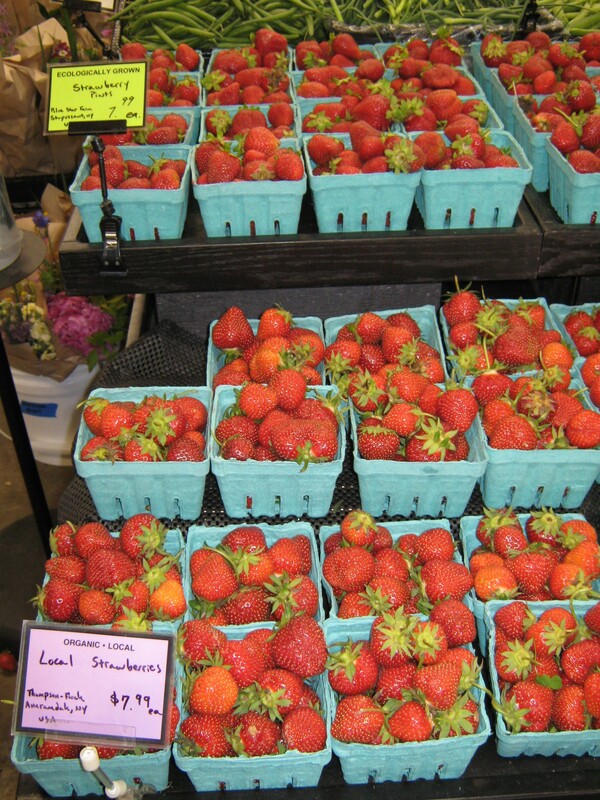 And no luck at the Chatham Real Food Market Co-op south of Albany in Chatham (Columbia County, NY) which had sold-out its initial supply of Blue Star Farm’s Certified Naturally Grown (CNG) strawberries grown in nearby Stuyvesant (Columbia County, NY). To be granted the CNG certification, farmers don’t use any synthetic herbicides, pesticides, fertilizers, antibiotics, hormones, or genetically modified organisms, and carrying out an inspection is an annual requirement of the CNG program. Next stop was the Hawthorne Valley Farm Store in Ghent, a little further south in Columbia County, NY. Bingo. Not only did the farm store have Blue Star Farm’s CNG strawberries available, organic strawberries from Thompson-Finch Farms in Ancram (Dutchess County, NY) were also prominently displayed as you came into the store. 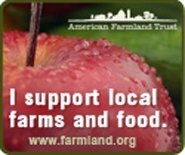 On its website, Thompson-Finch Farm notes that it has been certified organic since 1988. On the way home to Albany, I also stopped at the Chatham Berry Farm in Columbia County and purchased a quart of its no spray, pesticide free strawberries too. In a large bowl, stir and blend honey and sunflower oil. Add the whole wheat flour, soy flour, wheat germ and salt. Press half of the mixture firmly into oiled 8 inch x 8 inch x 2 1/4 inch square cake pan. Bake at 400 degrees F. for about 25 minutes. When cool, cut into squares. Makes 12 medium squares. Topped with a scoop of your favorite vanilla ice-cream or perhaps of Luna & Larry’s Organic Coconut Bliss (made with organic coconut milk and organic vanilla beans), these oatmeal strawberry squares are a sweet celebration of the pioneering contribution of Beatrice Trum Hunter’s to the good food movement.